To the casual observer, a group of ten young people on bikes passing through a South Korean city would not usually draw much attention. But this unique international group of cyclists was on a mission. Youth from Colombia, South Korea, the Philippines, Nepal, Mongolia, and the United States set off on a bike ride together from Incheon, South Korea. Over the course of 393 miles (633 kilometers), they rode across diverse terrain, encountered changing weather conditions, and experienced the evitable soreness that came with riding for five consecutive days. Kensu Bates, a participant from the United States, recalled that some of the cyclists had separated from the group due to varying skill levels, but by day three, the group determined to stay together and support one another. At the end of the fifth day, the exhausted group approached their destination of Busan with a sense of pride and accomplishment having arrived together as a unified team. 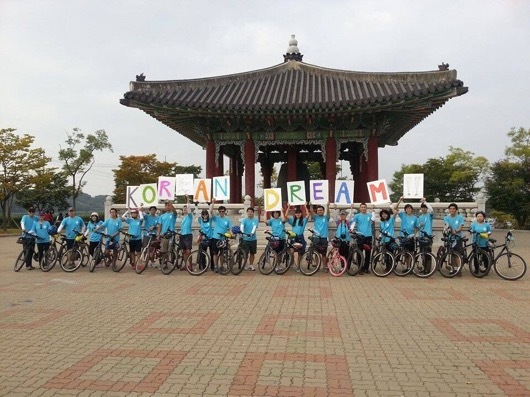 This Korean Dream Challenge bike ride is one of many bike rides happening in South Korea since 2013 as part of the One Korea Global Campaign, a movement to raise public awareness and build international support for Korean reunification. The Korean Dream is at the heart of the reunification campaign which articulates a vision of forming a unified Korea based on the principle of hongik ingan, meaning living to serve humanity by spreading peace and prosperity to the region and world. The principle of living for the benefit of all humanity is found in Korea’s unified history and culture with its most recent expression in the 1919 Korean independence movement. 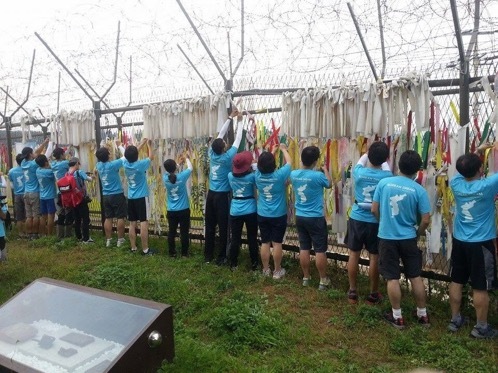 The One Korea Global Campaign Seoul Organizing Committee and Global Peace Foundation (GPF) Korea will host another bike ride in August of 2019 to commemorate the 100th year anniversary of the Korean Independence movement and to reawaken the unfulfilled hopes and dreams of the independence movement. Fifty participants, including North and South Korean college students and youth, and foreign exchange students studying in Korea, will ride 50 kilometers from Sangam-dong, Mapo-gu, Seoul to Odusan Tongil Observatory, Tanhyeon-myeon, Paju, Gyeonggi-do. Sponsors of the bike ride include Action for Korea United, the Korea International Student Support Association (KISSA), Evanston Development and Investment Creative Centre, Huasis, Buzz Media, The Doors Design Firm, and Global Peace Women. Organizers hope to raise awareness and draw support for reunification efforts. Learn more about the One Korea Global Campaign and sign up for monthly newsletters for the latest from Global Peace Foundation.